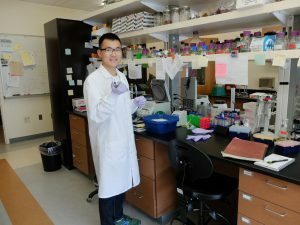 WSU graduate student Xiaochi Ma is making waves early in his career in viticulture, the science of growing grapes. “He takes initiative like no other student I’ve ever seen,” said Karen Sanguinet, WSU assistant professor in the Department of Crop and Soil Sciences and Ma’s co-advisor. Ma, who goes by the nickname Max, used those skills to win the Mike Vail Scholarship from the American Society for Enology and Viticulture (ASEV), a prestigious honor given annually to just one undergraduate or graduate student in the U.S., Canada, or Mexico. The interdisciplinary part of Ma’s education comes from those two advisors. Jacoby’s research is focused on water and how to get the ideal amount of it to crops, like grape vines. Sanguinet works on plants at the molecular level, involving high-powered microscopes and working with genetics. Ma is working to combine those areas to find the ideal grape quality for wine that’s also sustainable. One of the tricks to making good wine is reducing the amount of water given to the vine at a certain time each year, which stresses the plant. That water stress makes the grapes more delicious when made into wine. But if you stress them too much, it can impact how productive the plant is the next season or even kill the vine. Stressing a plant too much one year hurts you next year, and the balance is very delicate. “If we understand the dynamics of stress, if we can find markers on plants that do well under severe stress, then we can look for that quality through breeding programs and ultimately grow quality grapes using much less water,” Jacoby said. Working with Jacoby in the field, then Sanguinet in the lab, gives Ma a unique perspective on how grapes work. Ma, who had never driven a vehicle before coming to the U.S. after earning a master’s degree in China, has become a regular presence in WSU research vineyards near Prosser with Jacoby. Now he makes the drive regularly, when he’s not working with Sanguinet her in Pullman lab. Much of the work involved collaboration with the Washington wine industry. Ma and Jacoby conduct some of their research in commercial vineyards, including Kiona Vineyards and Hogue Ranches vineyards. He hopes to continue research in viticulture after he gets his doctorate, helping growers both in the U.S. and in China. In addition to the ASEV scholarship, Ma previously received a $25,000 grant from Western SARE (Sustainable Agriculture Research and Education) that included funding to attend the national SARE conference. He was one of three students from the Western SARE to receive funding to travel to the conference, where he presented on his research. His awards just feed into the qualities his advisors rave about. Ma plans to attend the upcoming ASEV conference June 18-21 to continue absorbing new information.